Temperature Corporation manufactures industrial chillers and complete modular chilling systems including water and air cooled chillers. We are proud of our 40+ years of experience supplying chilling systems and industrial chillers to a wide variety of industrial processes and production machinery applications, ranging from self-contained portable units through to completely installed “turn-key systems”. Some of these industries are: plastics, rubber, metal working, plating, die casting, chemical, printing, petrochemical, petroleum, pharmaceutical, beverage and many others. Download the 2019 Industrial Chillers brochure. Our process cooling equipment has applications in a number of industrial processes including: injection and blow molding, film, pipe, profile and cast extrusion, vacuum forming, laminating, embossing, calendering, coating, plating, banbury and high intensity mixers, die casting, die head, wire drawing, wire coating, and many more. 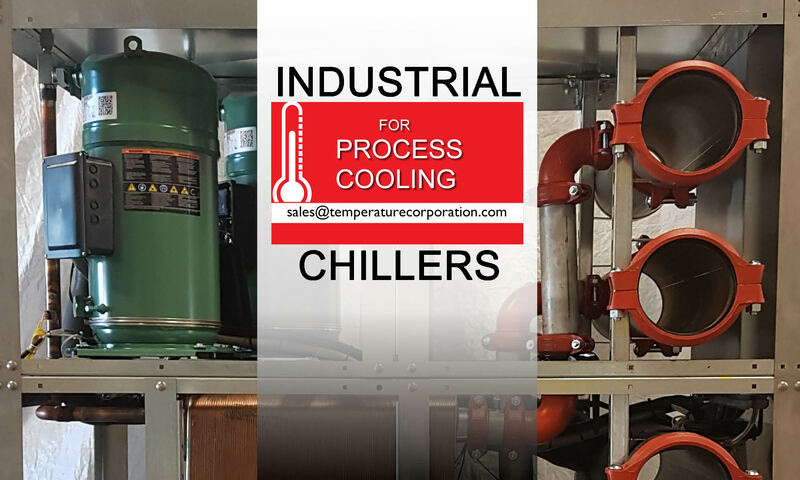 Since a large portion of our industrial chillers are supplied to the plastics, rubber and process industries, we specialize in their specific process temperature control applications. Our line of process cooling equipment includes portable chillers, central chilling sysems, packaged chillers, cooling towers and pump tank sets. If you require more information fill out the form below or send us an email to sales@temperaturecorporation.com, or contact our head office directly at (905)-513-8310. There are two options for building owners, process contractors and engineers when it comes ordering chillers and pumps. Order and install them separately or together as integrated pump packages. The Three Pump Manual Standby Tank Set is the most popular way to add a standby pump to the tank set. A third pump can be installed on the frame between the two existing pumps with a common discharge header. We are often asked to design and manufacture water and air cooled chiller systems for the wine industry. We provide custom chilling and controls systems to everything from the simple to the advanced winery.